If you’ve read my Apple IIc post, then you know I’ve always been an Apple II guy. I’m not going to repeat myself about why I chose an Apple II back in 1984 or rehash my long history with the platform itself, but the IIGS is actually a new addition to my collection. So it’s worth writing a bit specifically about it and how I’m using it these days. Some time after writing about my IIc, it died. After one of my periodic visits to the attic to bring it down for my latest nostalgia trip, its hard drive began erroring out on every single disc. And not simple failures to read, which usually indicate dirty heads (easily cleaned), but real I/O errors – the nasty things that cause Apple drives to yell at you in an ear-splitting manner. Probably fixable by just replacing the drive, but not worth it for a vanilla IIc that I’d have to cannibalize another one for anyway. 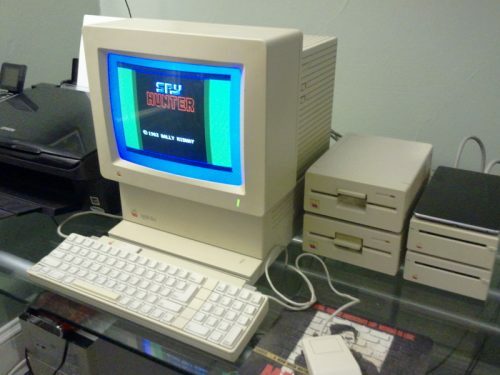 So I bought this IIGS, because it’s the best Apple II available and I wanted one when they were first on the market anyway. The IIGS was Steve Wozniak’s last real hurrah at Apple, and if he’d had his way, it would have been serious competition for Steve Jobs’ Macintosh. But Jobs saw the Mac as the future of the company and so neutered the system’s 16 bit 65C816 CPU to run at 2.8mhz rather than its native 4 or 5mhz, which limited what Apple could do with its graphical operating system (that ran in color, unlike the Mac) and also made it slow and somewhat painful to use. It was a shame, because the Commodore Amiga and Atari ST line were the system’s direct competitors and they were both more powerful than the IIGS. That said, the IIGS did have better sound capabilities than either one, and it was fully backward compatible with all Apple II software and most of its hardware add-ons, in addition to running its own native 16 bit software. So it’s still the best Apple II to own today. There are various methods these days of using hardware emulation to load programs on the Apple II, including the IIGS. I personally use both ADT Pro to transfer disk images directly from my PC, as well as a Floppy Emu that I’ve purchased. The Floppy Emu lets me store disk images on an SD card, and given how storage capacity has increased over the years, it’s pretty easy to fit every Apple II program ever made on a single $15 card. So I highly recommend either a Floppy Emu or similar storage option – new and old technology working together!